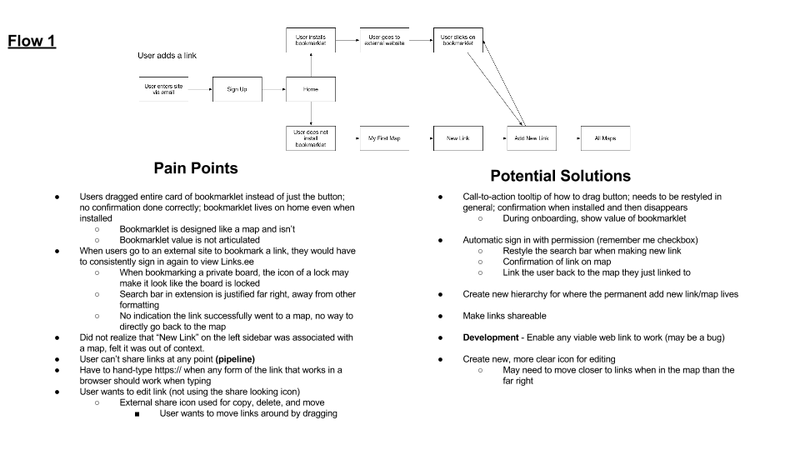 Links.ee is a web-based productivity tool designed to map the web. This unique bookmarking companion is set apart by its ability to collaborate with others sharing their favorited sites. This was an exciting project to be involved in as it gave us the opportunity with an actual stakeholder. We had the pleasure of working with Eric Peterson, CEO/CTO/founder the product. Links.ee is a bookmarking tool for individuals, groups, and teams. It's the easiest way to save, organize, share, and discuss links that are important to you. Think of a Dropbox-meets-Pinterest...or an Evernote just for your bookmarks. The web version is currently live and iterated in its current beta stage. We were tasked with the creation of an onboarding flow for Links.ee as our stakeholder wanted to decrease the bounce rate (from current beta users) and promote the site's value. However, through user testing and research, we uncovered various UX issues within the site itself. We suggested focusing on the UX problems first before tackling the onboarding. An intuitive site with clear functionality would require less onboarding instructions and have a higher percentage of users coming back. For this project, I was part of a four-person team working with Kelsey Klemme, Michael Ragland, and Mina Rebecca. This is the first time we would be working with one another. The time frame from start to finish would be 17 calendar days. As a team, we helped redefine the product MVP through extensive in-person user interviews and surveys; we also created scenarios, sitemaps, user flows and journeys, low-fidelity wireframes and high-fidelity interactive prototypes for our redesign. Pen/pencil + paper, whiteboards, Sketch, OmniGraffle, InVision, myBalsamiq, paper prototypes, Google Forms, Google Presentation. We analyzed Links.ee initially as users and noticed a great deal of functionality issues such as dead ends, confusing iconography, and a lack of MVP as there were many features included but not fully fleshed out. Although we were tasked with onboarding, we felt as UX designers we needed to explore the existing issues more. We wanted a successful onboarding campaign for Eric and Links.ee and to do so would require a more intuitive site. We also knew we needed more research and did extensive user testing to validate our findings. Through interviewing and highlighting the feedback we received, we were able to find correlations between the testers making it easy to pinpoint the key problems. Our initial testing had users explore the site to get their general views. We also did an intensive test with four other users where they would provide feedback from various tasks given to them. From the user test, we placed a little figure next to the issue uncovered to highlight the number of "complaints". This made it easy for us listing out the problems on the whiteboard to start prioritizing what needed immediate solutions. Before we moved forward with solutions, we needed to understand the users a bit more and the various paths they would take through the site. This would also help us define the MVP. Eric graciously provided us with personas and scenarios he already created which made it easy for us to start developing the next steps with the user in mind. With users in mind, we looked back at the pain points we uncovered and began combing for correlations. We took into account what the personas wanted to achieve on the site and the roadblocks they would encounter through various tasks. Through this, we began brainstorming potential solutions. Since some of the pain points were similar with one another, we planned around solutions that would solve multiple issues. We began creating a list that would encompass the major redesigns. As onboarding was also in the final deliverable, we wanted to start considering potential ideas as well. From here, we could redefine the MVP of Linksee. Users needed an easier way to organize, save, and share their favorited sites. These would be the items to keep in mind for the revamped site. With an idea on how to streamline the site, we went to work on visualizing the onboarding process. How would the process be? How would our users like to be educated? Utilizing Google Forms, we created a brief survey to see what user habits were and their preferences. From the survey results, the two favorite methods of instructions appeared to be hints popping up as users discover the site as well as being shown all functions and features at once. We planned on implementing similar onboarding but first we wanted to compare other sites to see how they onboarded. To understand how similar sites onboarded new users, we signed up as such and took notes for every step of the way. The ones we compared included Pearltrees, Pinterest, Kifi, LinkHubb, and Delicious. We are now ready to redesign the site and add the onboarding flow. We made a few iterations and A/B tested with users to determine the most ideal design. We tried not to stray too far from the original design as it was something our stakeholder wanted to keep for developmental reasons and the minimalist look. We started with paper prototypes as that was the fastest route to get to the design we needed to achieve. It also allowed us to easily test and tweak as needed depending on feedback. We also created lo-fi mockups of a potential onboarding flow for testing. We constantly tested our designs as we moved towards the final product. 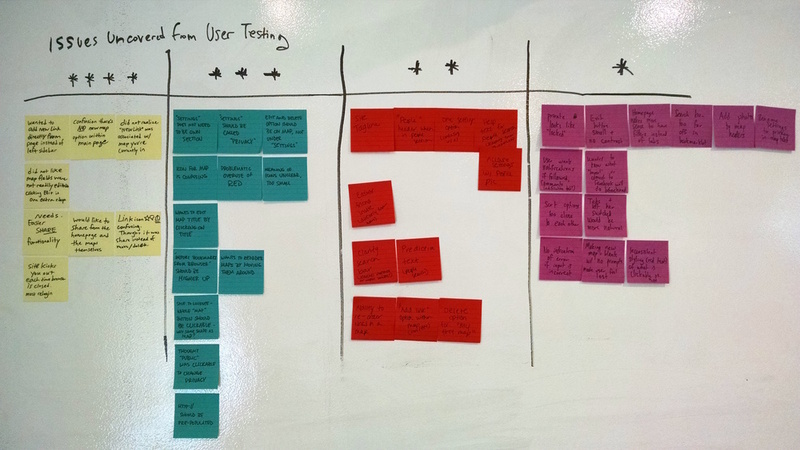 With user testing at every stage, we were ensuring our final design meets user expectations. With our redesigned site, we solved many of the UX issues we uncovered through research and testing. We simplified most of the functions and flows and made sure one page would lead to the next seamlessly without meeting any dead ends. We opted for a simple onboarding showing the user the potential of the site using minimal slides as well as non-invasive hint bubbles cuing the user for possible next steps. The prototype highlights the onboarding as well as some of the key features of the site. What exactly did we solve? In addition to the onboarding process which was our original task, we also provided solutions to various underlying UX issues within the site. Below was a chart we created highlighting the resolutions. We set out to solve the issues that were priorities. Creation of a "warm" signup flow - current iteration did not allow us to fully mock it up as the function on the site was not fully built out. Version control for the bookmarklet tool for different browsers. Our deliverable only provided the example if user were using Chrome. Eventually, this would be done away with as a button would eventually replace the bookmark link Linksee currently uses. Build out the social aspects of the site. There were still some bugs with the invitation of friends and followers. We would need to do further testing to see how users would respond. Plan interactions around movable and draggable folders and links to organize information more easily. Continue to test and see how users interact with the site during onboarding and how to make the site stickier. This was an interesting project as we ended up taking a detour to solve underlying issues before tacking the original task of onboarding. With extensive user research we were able to validate our UX concerns to the stakeholder. Solving underlying UX issues would result in a successful onboarding as functions and features are more intuitive to the user. In terms of design, we did not venture too far from the original as we wanted to respect the design and the sanity of the development team. In an ideal world, we would have loved to help build this from the ground up. I believe this proves the importance of UX as a business would want a product adhering to some UX standards upon creation and pre-release. It is much easier building on an existing UX foundation rather than going through an UX overhaul on a fairly complete product.